1) BESA Wiki is online! The brand-new BESA Wiki (http://wiki.besa.de/) is the place to find answers to (nearly) all pressing questions concerning BESA software, and to find out more about the best analysis pathways for EEG, MEG, and MRI data. It is sub-divided into the topics FAQ, BESA recipes, andDid you know…? You can also search by categories, e.g.ERP/ERF, Source Analysis, etc. – or simply type your key word in the search mask. The BESA Wiki now incorporates all FAQs from the previous BESA web page section and more that we have collected from your input. The previous BESA FAQ link has been replaced with theintroduction to the Wiki. 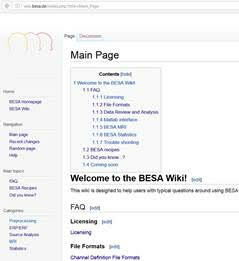 Of course, you are more than welcome to join and contribute to the BESA Wiki yourself! Find out more at the end of the Wiki home page. Enjoy – and let us know if you are missing anything that you want us to add! After all, this is a platform that is designed for you, and is meant to grow with your help. In collaboration with our sales partner Brain Vision LLC, we will hold a three-day workshop in Philadelphia, USA, from 10th – 12th August 2016. It is possible to book the full workshop which includes material for introductory and advanced levels, or to book the two-day advanced workshop only. At the end of the first day, an optional tour of the magneto-encephalography lab is also available. The first introductory day will take care of general review, ERP, and batch processing; the second day will be spent on source analysis and source imaging, and the third day will be devoted to source montages, source coherence, and statistics. All in the well-established mix of introductory talks and hands-on data analysis. Please visit https://www.eventbrite.com/e/philadelphia-besa-research-workshop-tickets-25704064549 for more information and to register. BESA Research 5.3 has been around for some time – in the software age, it seems like a very long time; remember when Gangnam Style hit the planet? The last version was released in April 2012, and it has been superseded by the more advanced versions BESA Research 6.0 and BESA Research 6.1. So the time has come to say goodbye, at least in terms of supporting the product. Similarly, BESA Statistics 1.0 has been superseded by BESA Statistics 2.0last year. Support for these old product versions will expire at the end of September 2016. The full list of supported products is available on http://www.besa.de/support/supported-products/. If you are interested in upgrading from BESA Research 5.3 or BESA Statistics 1.0 to the latest version, please contact sales@besa.de or request a trial version onwww.besa.de/contact/trial-order-form.